We all know that social media is a fast moving world but it’s getting even faster with more and more social network news. When I started broadcasting my social media news show in 2015 there were two or three new social networking features to report each week. Now there are as many as 30! Now there’s an easy way to stay bang up to date with the latest news from the world of social media and to learn top social media tips! 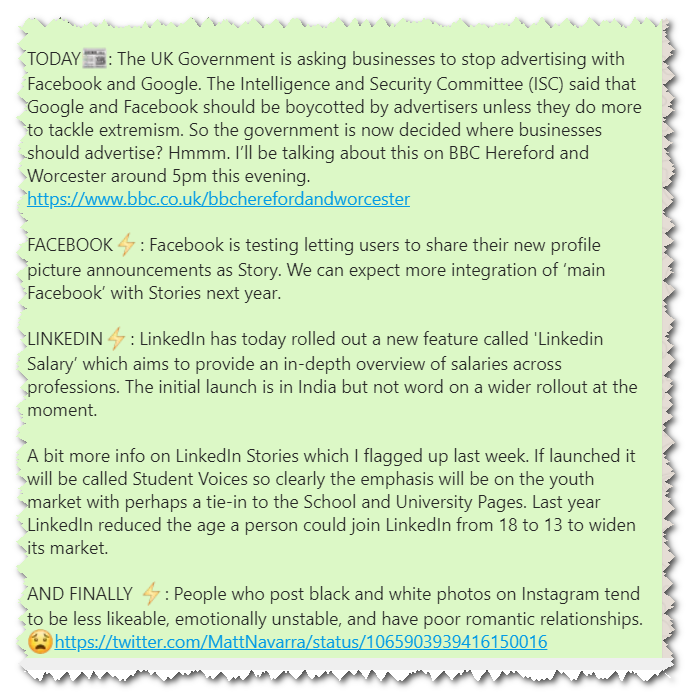 My FREE The #SocialMediaDaily keeps you up to date with news and new features from Facebook, Instagram, LinkedIn, Twitter, Pinterest and WhatsApp as they’re announced, tested or rumoured. Each day you’ll receive a short, simple WhatsApp message to keep you bang up to date on new social media features, plus tips and insights on applying them to grow your business, charity or organisation. Note that I use a WhatsApp broadcast not a group, so the only messages you’ll receive will be from me, not other recipients. If you’d like to receive The #SocialMediaDaily and learn how to grow your or your clients’ business using the latest features, please subscribe here. To receive the #SocialMediaDaily and learn how to grow your business using the latest features click the button below. For a wider range of social media news, intereviews plus top tips, watch The #SocialMediaShow on Mondays LIVE at 9am over on my Facebook Profile.